Martin and Heinke had a great race in the semi final overcoming the Americans who had the better of them in the heat. The Romanians dominated the final and the finalists were clear. It was a tight race with the South Africans for the 5th and 6th places. This was the comeback season for Drew Ginn following back surgery that kept him out of the 2000 Games. It was also the first international outing since those Games for James Tomkins. They raced the heat and semi final to perfection and looked likely to take the gold. However the other crews had different ideas and James and Drew missed out on a medal by 0.05 seconds in a very tight race—less than half a second between silver and fourth placing. The crew failed to handle the rough conditions on the finals day. The Australian double looked set for a medal in this event after winning both their heat and semi-final in the fastest times. The Hungarians and Germans had held something back for the final and surprised the field. It was disappointing for the Australians but still a good result. The Australians comfortably won their heat and semi final and had over a second in the final. They were clearly the in form crew in this event and raced superbly. This was the first start for Dan Stewart in this very tough event. The Australian crew started well winning their heat and keeping the eventual bronze medal winning Danes in second place. They repeated this in the semi final but were beaten into first place by the Germans. The final was disappointing for the Australians but shows the depth and toughness of these fields with the Danes picking up bronze and the Germans missing out of a medal. The Australians had a good run through to the final meeting only the silver medallists on the way through and defeating them in the semi-final. Therefore the final was a disappointment coming in fourth. The heat times gave away the final placings with both Belarus and Germany having the fastest times by far. Denmark was the surprise finishing third in the heat and second in their repechage. 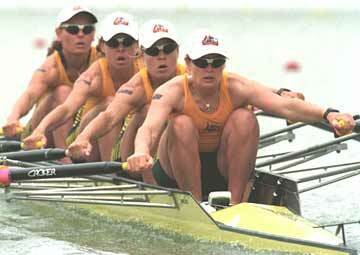 The Australian's fourth placing was consistent with their racing results. The heat and repechage results showed the final result. However the final was a tightly run race with less than a second between the first three crews. The crew raced well and showed the promise that the selectors and head coach sought. Anthony Edwards was released from double scull duties to race the single. He performed very well but missed out on a medal.